The new school year has started, signaling the end of an exciting summer of sport. Many young people are starting to think about mouth protection, so that they can safely enjoy the sports they love. Our Autumn offer has now ended, but you can still purchase from our exciting range of blanks and accessories, which combine to create strong, protective shields, ideal for use in both amateur and professional sports. 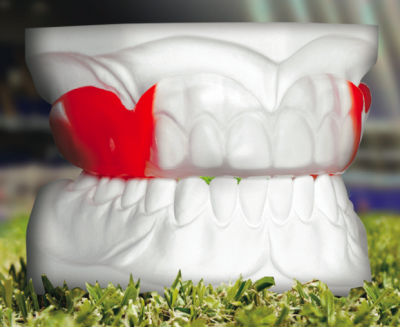 SCHEU Bioplast® blanks create fun, creative sports mouthguards that are sure to appeal to younger sportspeople. Made from a soft, pliable rubber material, the blanks are available in an array of bright colours, patterns and flags. Designed to work with a Scheu machine, the blanks will work equally well with any machine that will take a 125mm diameter blank. You can adapt them to suit your patients’ needs and even layer them to create different thicknesses and colour effects. Bioplast® Xtreme blanks feature an integrated, V-shaped reinforced layer, to give extreme protection in the front tooth area. Blanks can be layered to offer even greater protection, if needed. Xtreme Deco blanks are made using the latest printing techniques to create fun, multicoloured patterns and designs. For more information, or to place an order, just visit our online shop.